A few things I do to make Passover cleaning a more positive experience for me and my kids. Try to do a little each day, as Chana Jenny says, slowly and gently – and I would add . . . surely. Don’t wait until the last minute. Do what you can do early – as I want to say, EXPECT THE UNEXPECTED – for example, (hopefully not), a broken washing machine, or illness. If you are preparing, like from today – on . . . you will be better equipped for anything that happens along the way. The idea being, that if you are well-prepared, you will be free to enjoy all the wonderful things that come with Pesach. Perhaps a Sushi-making workshop for your next birthday – or as a reward for finishing your Pesach cleaning. It is quite fun, and not so hard! 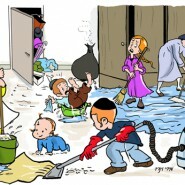 Easier than cleaning for Pesach! Thanks so much for your wonderful website! I look forward to your posts each week! Regarding Pesach cleaning, I heard from our rav that although it is only necessary to get rid of a k’zayit, it is also necessary to get rid of any whole food that is still edible. For example, one small cheerio. Perhaps you can clarify this with Rabbi Sperling. actually I do start from the kitchen. all the rest is bonus spring cleaning. being a working mother of 8 (BLI AYN HARA) there is not too much time! and another thing: don’t be afraid to throw away!